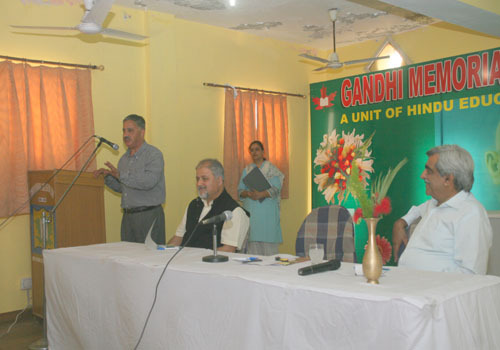 Gandhi Memorial College of Education, Raipur, Bantalab, Jammu organized an extension lecture by Prof .Ashok Aima H.O.D of MBA (TTM) in Central University Jammu on the topic “Contemporary Trends in Teaching-learning Pedagogy and Institutional Excellence”. 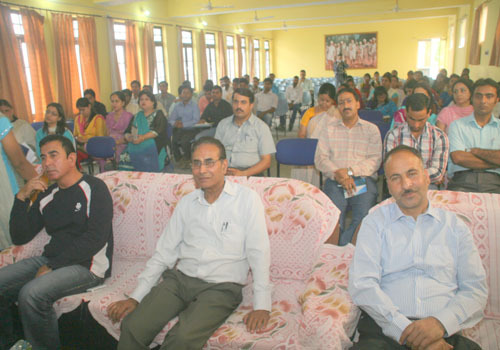 A galaxy of educationists, professors of various Institutions and some prominent personalities from across the state were present during the lecture and interactive session emphasizing on enhancing techniques of teaching process, Prof Aima also laid stress on improving student – teacher relationship to achieve the goal of excellence in educational system. 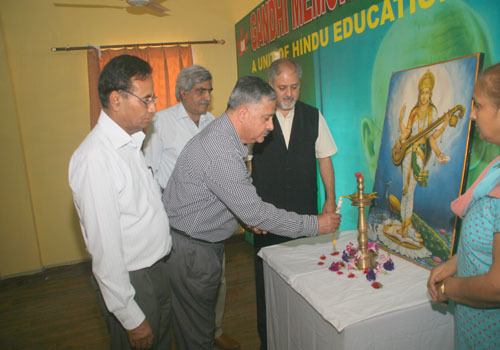 He said that commitment and confidence builds a strong character in a teacher and this helps in imparting desired knowledge among the students. Teaching is not just dictating notes but it is preparing a student to enhance his/her knowledge to face the challenges for making a career, Prof Aima said in the course of power point presentation. 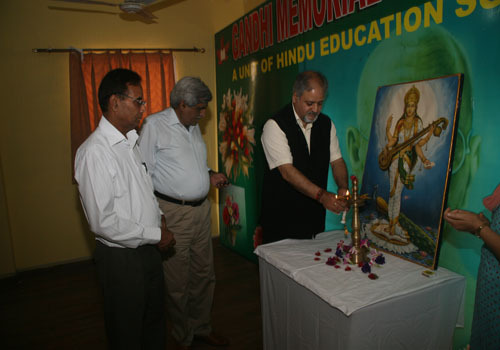 Speaking on the occasion, the President of (HESK) Mr. Anil Dhar said that, improving the education system has become essential as world is faced with enormous challenges. We have to put thrust on creativity and tapping the inherent potential of the youth who can guide the destiny of the state and the country. 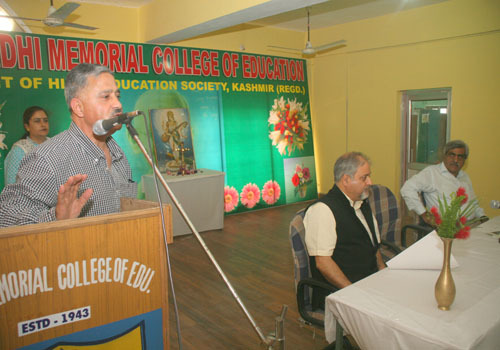 Mr. Dhar said and added that institutions under HESK will strive to contribute in this direction. Prof B.L. 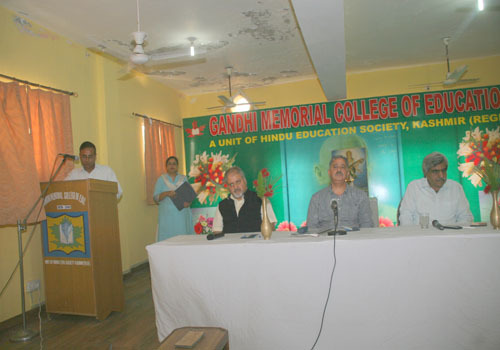 Zutshi educational advisor to HESK and Mr. M.K Bangroo (Member E.B-HESK) also spoke on the occasion. 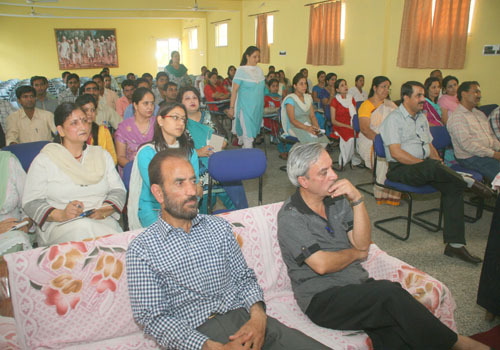 The extension lecture was followed by an interactive session between the faculty members/students and the resource person was very enlightening and informative and kept the audience spell bound. 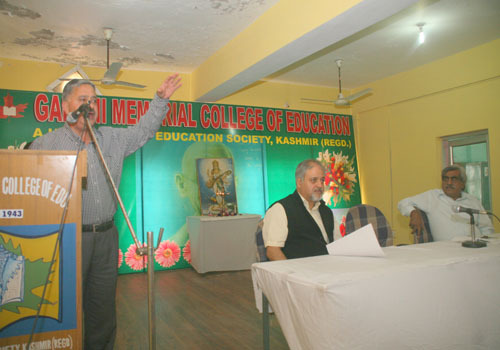 Earlier, the Principal GMCEJ Prof. G.L Koul in his welcome address said that the college has already undertaken a series of academic activities and the lecture by Prof Aima was a part of the same with a view of enhancing academic culture in the college .He also informed the audience about the academic profile of Prof. Aima.